Proposal for survey of site. Job no. 06/251 for ADM Milling, Healings Mill, Tewkesbury. Proposal for survey of site. Job no. 02/369 for ADM Millers Ltd, Healings Mill, Tewkesbury. Site assessment. Job no. 97/266 for Allied Mills, Healings Mill, Tewkesbury. Feasibility study "Appraisal of the feasibility of continuing the activities at Healings". Includes history booklet, "The story of a country mill". Job no. 97/245 for Allied Mills, Healings Mill, Tewkesbury. Packing floor alterations. Packing line. Includes drawings and photos. Job no. 97/216 for Allied Mills, Healings Mill, Tewkesbury. Relocation of pellet press and boiler room. Includes photographs. Job no. 93/273 for Allied Mills, Healings Mill, Tewkesbury. Scheme to rationalise warehouse and outload re movement of bays, bulk, lorries etc. Engineers' material, photos. Job no. 93/273 for Allied Mills, Healings Mill, Tewkesbury. Scheme to rationalise warehouse and outload re movement of bays, bulk, lorries etc. Drawings. Job no. 93/273 for Allied Mills, Healings Mill, Tewkesbury. Scheme to rationalise warehouse and outload re movement of bays, bulk, lorries etc. Photos and 2nd wheat intake. Job no. 93/273 for Allied Mills, Healings Mill, Tewkesbury. Scheme to rationalise warehouse. Photos pre-commencement. Job no. 93/273 for Allied Mills, Healings Mill, Tewkesbury. Scheme to rationalise warehouse and outload re movement of bays, bulk, lorries etc and 2nd wheat intake. Drawings, specialists. Job no. 2123 for Allied Mills, Healings Mill, Tewkesbury. Pelleting Plant. Job no. 2189 for Allied Mills, Healings Mill, Tewkesbury. Right of way diversion - proposed footbridge. Retained only drawings, several items of correspondence and press cuttings. Job no. 1988 for Allied Mills, Healings Mill, Tewkesbury. Garage. Files, drawings. 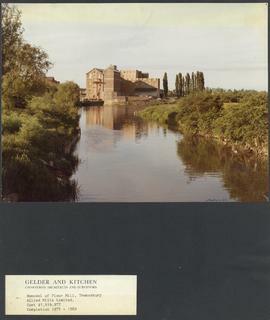 Planning appeal includes proof of evidence from David Exley with account of his career and history of Gelder and Kitchen. Job no. 1992 for Allied Mills, Healings Mill, Tewkesbury. Demolition and new offices. Job no. 2051 for Allied Mills, Healings Mill, Tewkesbury. Maintenance files and drawings. Job no. 1791 for Allied Mills, Healings Mill, Tewkesbury. Drawings - plans and elevations. Job no. 1791 for Allied Mills, Healings Mill, Tewkesbury. Press cutting re. sales of flour to Sri Lanka, site plan (remainder of file disposed of).